Joshua 1:9 – [God speaking] This is My command—be strong and courageous! Do not be afraid or discouraged. For the LORD your God is with you wherever you go. What a great benefit to live life in the assurance of God’s presence, power and provision! Today, hear God calling you once again (He never gets tired) to a place of courage or strength and be strong and have courage. You can do it because He said you can! 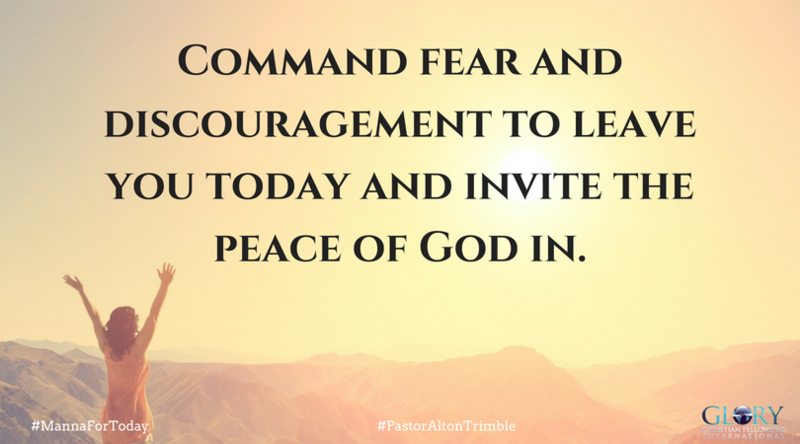 Command fear and discouragement to leave you today and invite the peace of God in. Today, know that wherever you go your awesome God is with you! Thank you Lord for your presence, provision, and power! In Jesus mighty and matchless name, Amen! Lord, my strength comes from You, and as long as I abide in You I know that I can be strong and courageous. Amen! Lord, thank You for always being present. Help me to walk in all the provisions you have given me by acknowledging them and thanking You throughout the day. In your precious name, Amen.